Parts of southern Kansas saw more than 10 inches of rain on Wednesday, producing flash floods that washed away a car with a father and son inside, killing both. Water rescues and evacuations were reported throughout the region, as record rainfall was recorded in Fort Smith, Arkansas, at 3.3 inches, producing additional flooding. In Iowa, southwest of Cedar Rapids, many areas saw almost 2.5 inches. 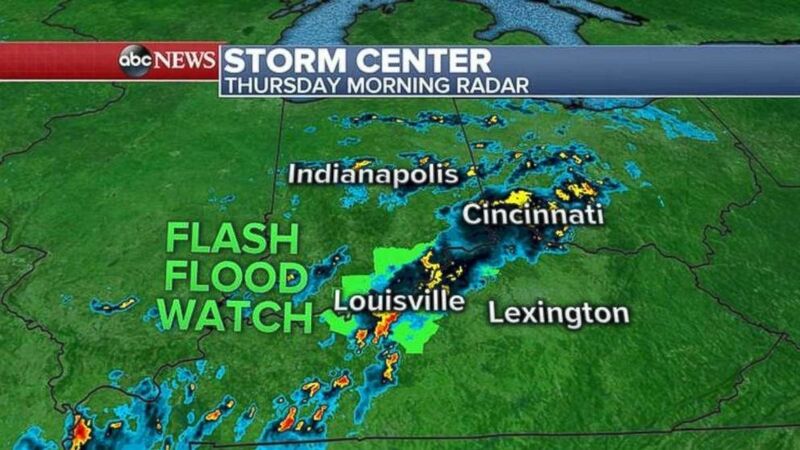 The storm system responsible for all of the precipitation is heading east today into the Ohio Valley and Great Lakes areas, meaning flash flood watches have been issued in and around Indiana and Kentucky. A flash flood watch is in effect for areas near Indiana and Kentucky. This afternoon, low pressure will be centered in Michigan as the trailing cold front makes its way through the Ohio Valley. More heavy rain is expected through tonight. 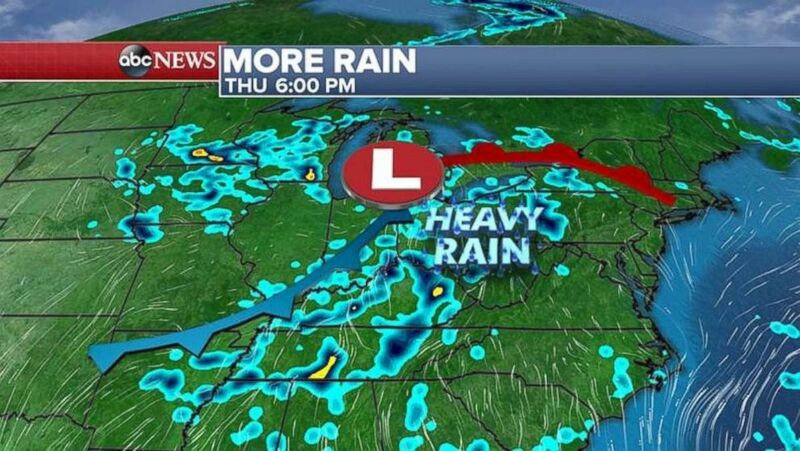 Showers and thunderstorms will be heading into the Northeast by Friday afternoon, adding more precipitation to soaked ground in Pennsylvania and New York that saw flooding just two days ago. 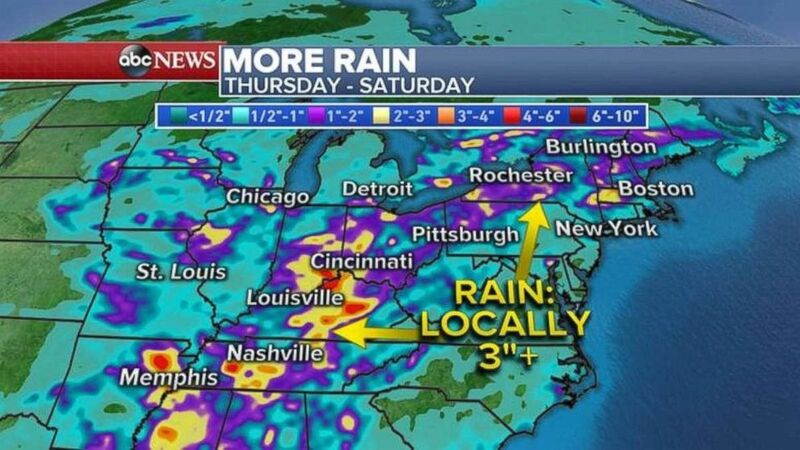 The eastern U.S. is expecting even more rain through Saturday. Out West, at least 52 uncontained fires are burning, with fire watches issued for Montana, Idaho, Washington and Oregon. Thunderstorms with lightning and gusty wind are in the forecast today and into tomorrow for the Northwest and northern Rockies. Gusts may reach 50 mph. 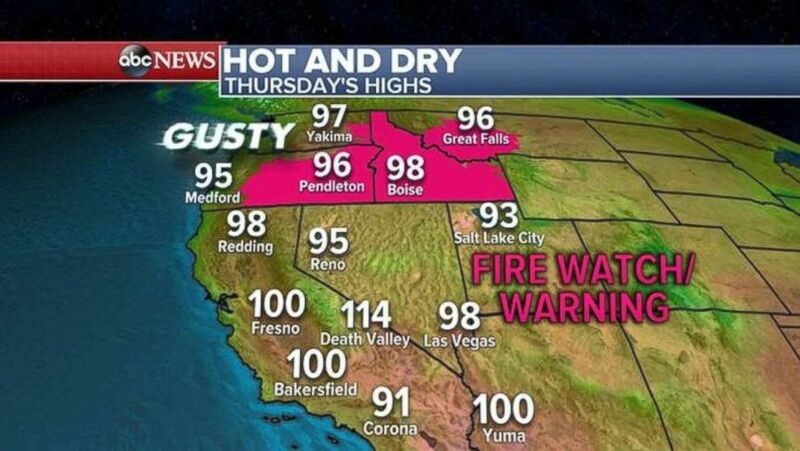 More hot and dry conditions are expected out West. As parts of the Northwest cool, most of California and Nevada will be heating up as the weekend draws near. Temperatures in many spots will be in the triple digits.